After Iran denies it is has military presence in Syria, Netanyahu advises Iran to 'get out of there fast', vowing to intensify air campaign. 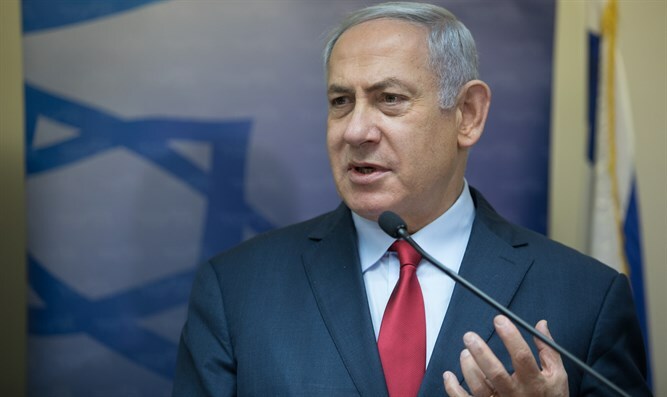 Speaking at the swearing-in ceremony of the IDF’s 22nd Chief of Staff, Aviv Kochavi, in Tel Aviv Tuesday, Netanyahu responded to Iran’s claims on Monday that it does not maintain an armed presence in Syria. “Iran does not have a military base and military presence in Syria and was present at the request of the Syrian government for advisory mission and fighting the terrorists,” claimed Iranian foreign ministry spokesman Bahrem Qasemi, adding that Iranian officers in Syria were merely there to “advise” the Syrian regime. Netanyahu mocked the claim, offering to “advise” the Iranian government on its deployment in Syria. "Yesterday I heard the Iranian foreign ministry spokesman saying 'Iran has no military presence in Syria, we only advise them',” said the Israeli premier. "So let me advise them -- get out of there fast, because we'll continue our forceful policy of attacking, as we promised and are doing, fearlessly and relentlessly," Netanyahu continued. The comments came just days after Netanyahu confirmed publicly that Israel was behind recent airstrikes on Iranian weapons depots in Syria. "Only in the past 36 hours the air force attacked storehouses of Iran with Iranian weapons at the Damascus international airport," Netanyahu revealed on Sunday, a rare break from Israel’s policy of official ambiguity regarding the IDF’s activity in Syria.